In order to protect your application with licensing and enjoy all the features provided by BLT in your own LabVIEW program, you must create a BLT Executable. When you create a BLT Executable, it basically creates an normal EXE build specifications in your LabVIEW project and configure it to include everything required by BLT to works. oSelect the product in the tree and click on the Build Specifications button. (You can also right-click on your product in the tree and select Configuration >> Build specifications (EXE)...). This window lists all the EXE build specifications existing in your LabVIEW Project. o Standard executable: Represents a normal executable build specification created with LabVIEW. o Valid BLT executable: Represents a valid BLT executable that includes all the required dependencies for BLT to work. o Corrupted BLT executable: Represents a BLT executable that miss certain dependencies. oCreate a new BLT Executable: Programmatically create a new BLT executable in your LabVIEW Project. oAdd or Repair BLT: Select a standard executable or a corrupted BLT executable and click this button convert it in a valid BLT executable. oAdd BLT error tracking: Programmatically add the Log Error function in your LabVIEW code in order to report errors occuring in your application to your Licensing Server. 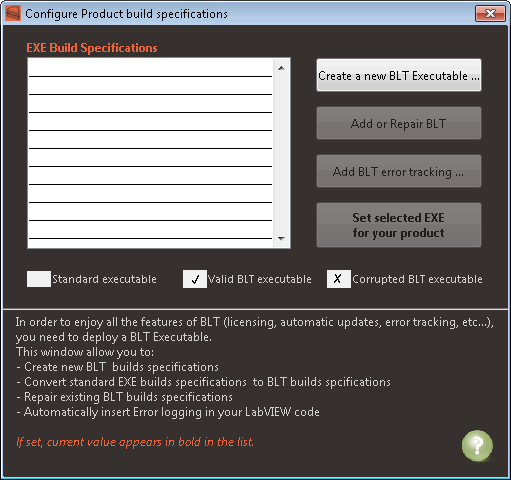 oSet selected EXE for your product: Select an valid BLT executable in the list and click this button to assign it to this product in BLT.